Comma-separated values (CSV) are a widely supported, relatively common format that’s used to divide data into fields that are separated by delimiters. Although “comma” is indicated in the name, there are other characters that can be used to achieve the same delimiting effect. 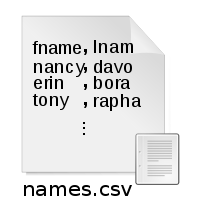 These single reserved characters can exist as commas, semicolons, tabs, or in some instances --spaces. Unrestricted by specific character sets CSV works just as well with ASCII as it does with Unicode. As a data format CSV predates the personal computers we know today; first supported by IBM’s Fortran in 1967. CSV was especially useful at that time because comma-separated value lists were far less susceptible to producing errors, and easier to type. Due to its accuracy, CSV is still used today when interchanging database information between machines that do not share the same architecture. CSV’s efficiency comes largely from being human-readable, and its systemic avoidance of many of the common incompatibilities that exist in computing today. After having gone through decades of development CSV is supported today by many different spreadsheet software including Excel, Apple Numbers, Open Office Calc, and Gnumeric. Likewise many online spreadsheet environments such as EditGrid and Google Docs have also adopted support for CSV. Further CSV exists as an integral part of many modern database management systems; embedded in the very programming languages that make them tick. Despite the industry wide adoption of CSV over the last 50 years, it does not automatically work with every type of document. When you have a file format containing data that isn’t CSV compatible, it becomes necessary to convert those files. Here at CoolUtils we’ve developed a convenient, easy-to-use utilities that can perform those conversions for you. Whether you need to convert CSV files to PDF, HTML, TXT, DOC, etc., the Total CSV Converter can help. 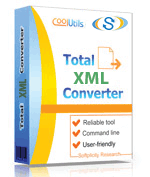 If you want to get CSV files out of your XMLs, try Total XML Converter. It converts XML to CSV and other formats; either one file or a bunch of them.